The huge day we had yesterday had taken its toll on me, 512km isn't much but with 160km of that on 4wd tracks it soon makes a difference. I had slept like a baby, through my alarm. When I did wake I noticed a brilliant golden glow shining through the flyscreen of the tent. The sun was well on its way to rising!! By the time I came to my senses and realised just what was happening outside I jumped from my swag and out of the tent to grab my camera. 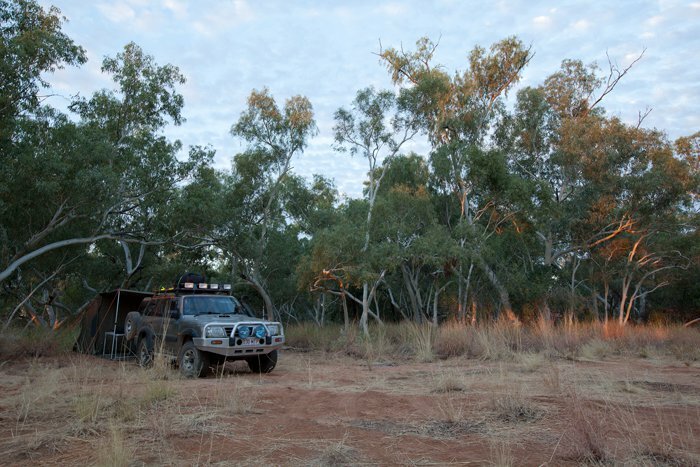 As I looked around I couldn't believe what lay just through the trees only metres from where we slept. 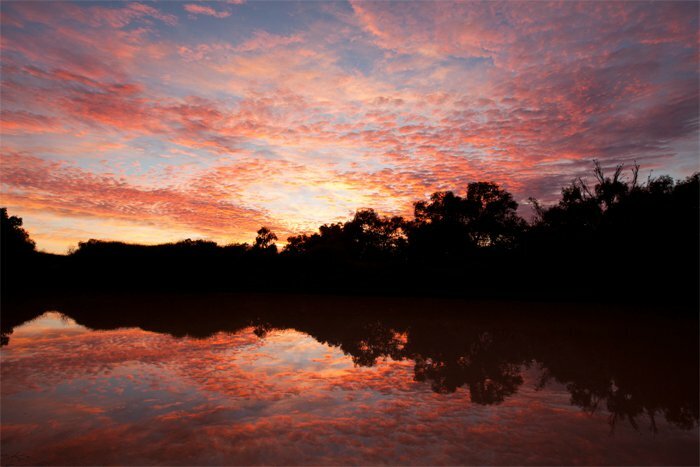 The Diamantina River was just amazing. I quickly set up my tripod after scrambling down the bank and took a test shot, only to have "CARD FULL" pop up on my screen... Oh no... I took a quick tumble getting to the top of the bank, got a new card from my bag in the car and raced back down to the waters edge. WOW!! I took a few shots and with that the colour quickly faded, I had only just managed to grab them in time. Not a bad effort, I was in my undies the whole time! I climbed back up the river bank got dressed. It was time to pack up and move on. We had to pass back through town so we stopped at the Birdsville Roadhouse, filled up with fuel and put some air in the tyres for the day ahead. Diesel wasn't too expensive, we only paid $1.70/L. 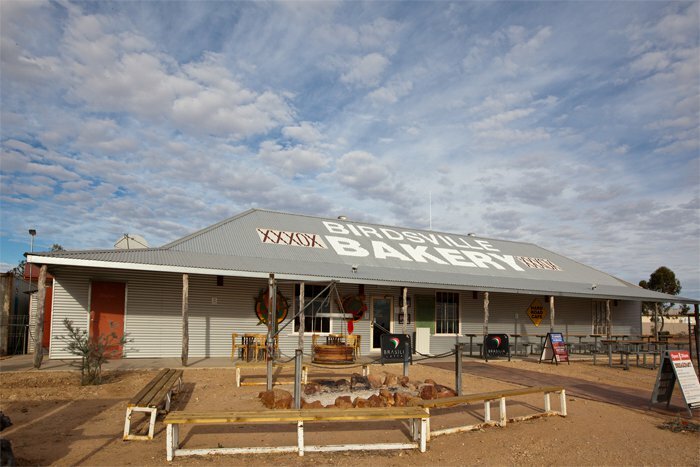 We were so impressed with the Birdsville Bakery the day earlier we thought we would grab some breakfast there before going too far. Ham, cheese and herby tomato toasties!! Yumm!! After devouring our meal and enjoying a real coffee we had enough energy to start the day!! We grabbed a few photos as we passed through town. 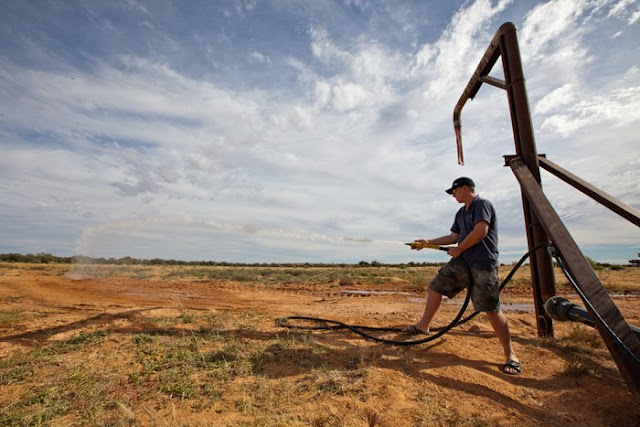 After making our way back past the Artesian Bore Head (Day 6) we were on our way again, this time on the Eyre Developmental Road towards Bedourie. This was our intended target for the day. Only a few short km's down the road we came across 2 dingoes on the side of the road, they took the bolt as we moved closer. 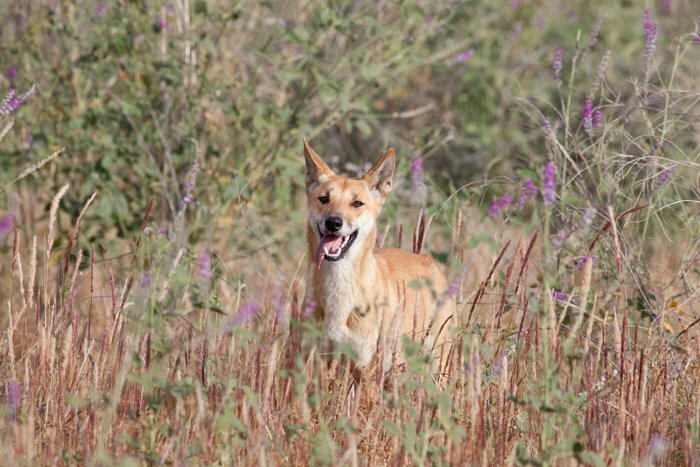 I walked into the scrub on the side of the road here to see if I could spot them again and sure enough, there was one cheeky dingo posing amongst the purple flowers for me. The next POI was around 14km out of town, something you can only see in this area. A group of Waddi Trees. 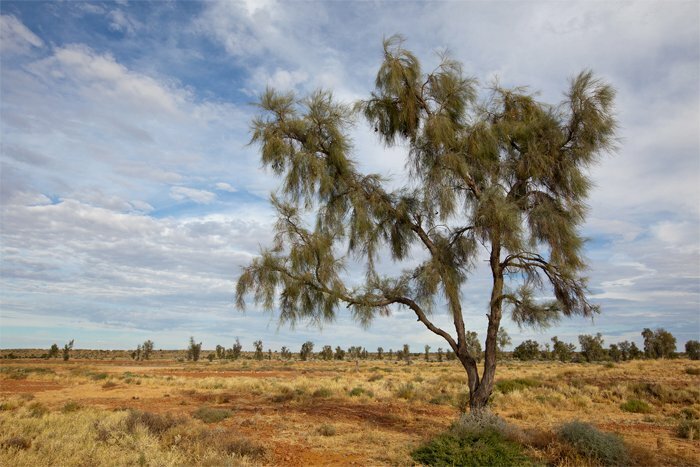 These trees are very rare and only found in 3 locations around Australia. The one we were at and another of these are located within 300km of each other. 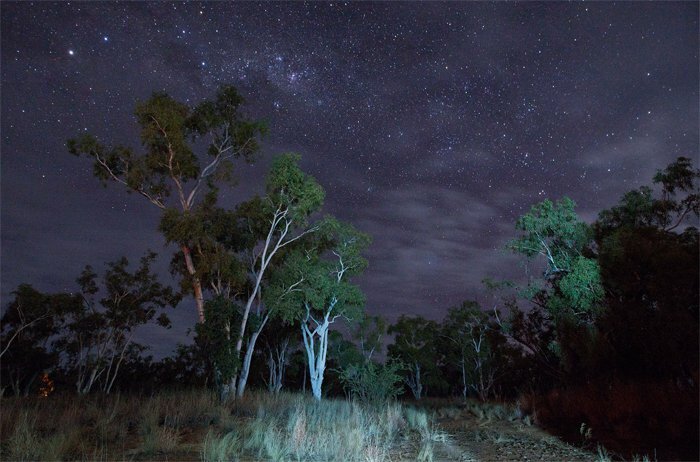 The other is in the NT. Quite an interesting tree. Around 10am we had found ourselves pulled over again, this time for morning tea and a good break. This fully equipped roadside rest stop was ideal. Christine this time enjoyed a stale beer from the complimentary fridge while using the loo!! While I freshened up Christine caught up on the washing! We had a lot of fun here!! This would have been a great place to spend the night as so much fun could have been had, but we had best keep moving. Our next POI was an old homestead "Carcoory". We knew what to expect here as we had seen some photos at Windorah as we passed through. It was stunning!! 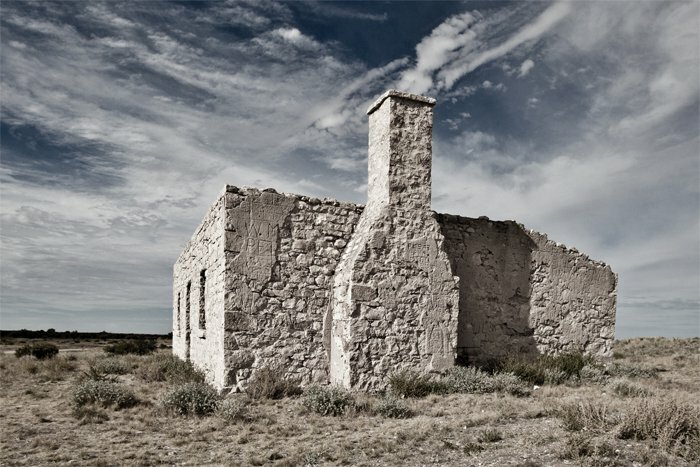 The remains suited the harsh landscape perfectly and a sky like we had was ideal. I took quite a few photos here, trying a lot of different compositions and angles. I like this one with the smoke from the fire inside coming out the chimney. 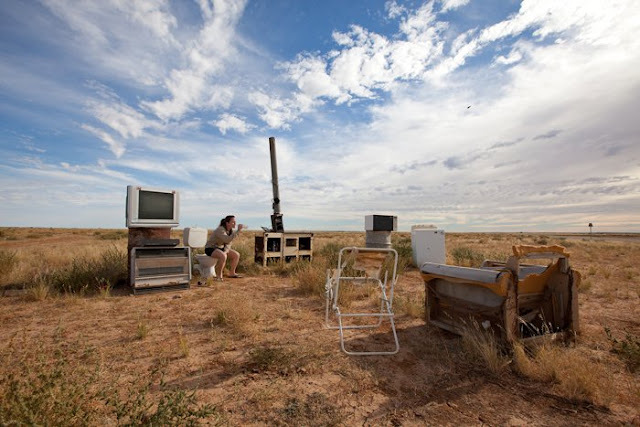 We spent quite a bit of time here taking it all in, imagining what it would have been like to wake up here in the mornings, every day all those years ago. It would have been something else that is for sure! Just down the road we stopped at Carcoory Bore where I tested out my skills as a Fireman. This water was hot, straight from the artesian bore near boiling point. 20 minutes or so later we came across our first obstacle... Water!! The floods have increased the water table so much that the road to Bedourie was still closed, being well under water. The only way through one of the largest pelican breeding ground accessible by road in Australia was by boat! There was however a detour on a higher road that was quite a bit longer and passed through some large cattle properties. 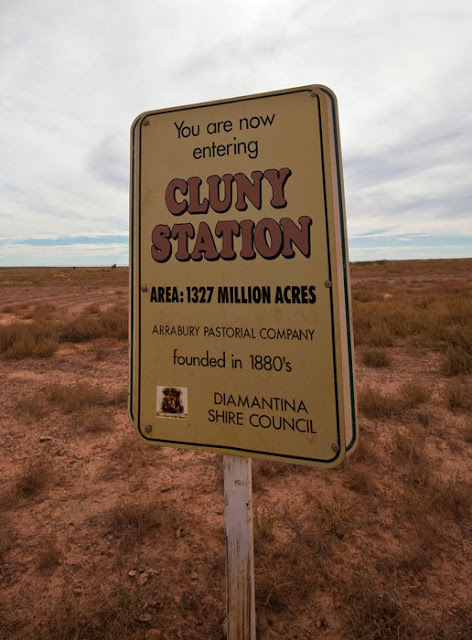 The first one we entered was Cluny Station, a measly 1327 million acres. Yes that was million acres.... It was huge!! It was while passing through this property we realised how deadly and remote the Australian Outback can be. 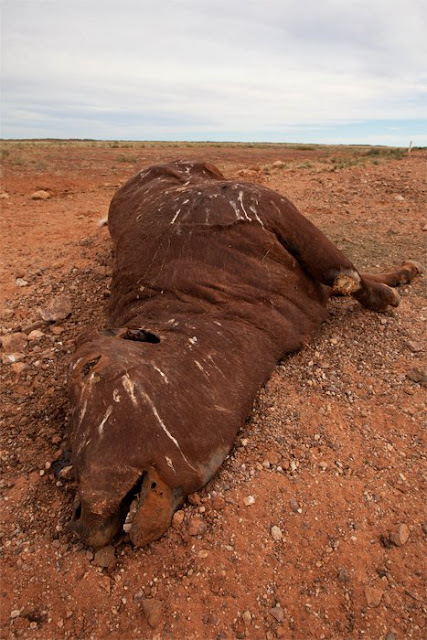 There was so much roadkill on the road and dead animals in the paddocks it wasn't funny. Roo's, Emu's, Cattle and pigs. The birds of prey were everywhere. This was a common site along the road! As we progressed further along the way we had a suicidal Hawk dive bomb us, we didn't quite hit him, but the rat he was carrying did, smack bang on the middle of the windscreen. Last thing I expected to see on there was rat guts. A few swipes of the wipers and some water and it was good as new. I did expect a dead rat to be caught up in our tent or clothes on the roof which we did never find! So pretty happy about that. 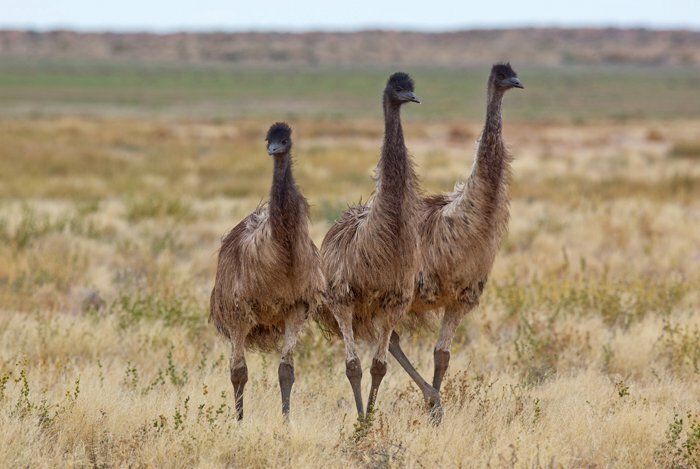 As we came back to the main road and the Bedourie turnoff we spotted 5 Emus just to the side of the road. There were 2 males and 3 females and they were pretty interested in me, they came within a few metres of me. Very cool!! 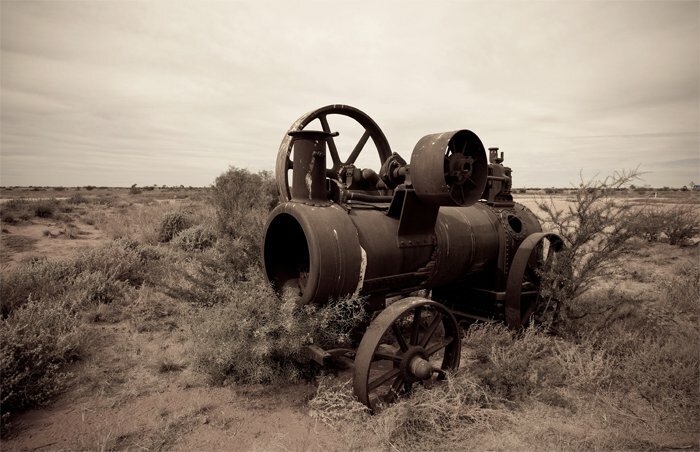 We had a quick stop at the No.3 Bore, and poked around the remains of the old steam engine. 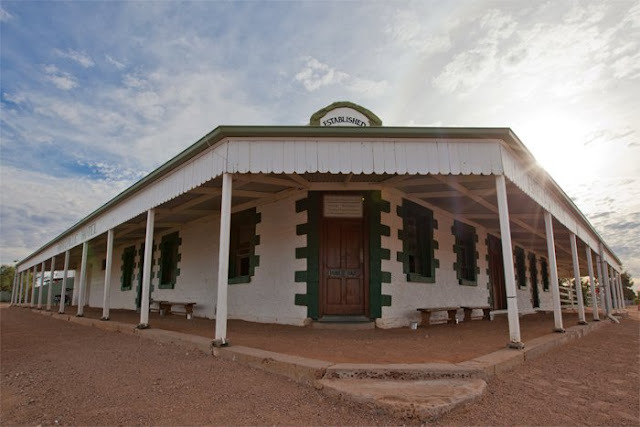 We had intended to spend the night in Bedourie, but once reaching town and a visit to the info centre we realised there really wasn't much to do there... The Old Mud Hut, Police Station and Royal Hotel... That was about it... We wandered around these 3 places and decided to make up our minds what we were doing over a burger at the roadhouse. They had really good food!! We fueled up for $1.86/L. 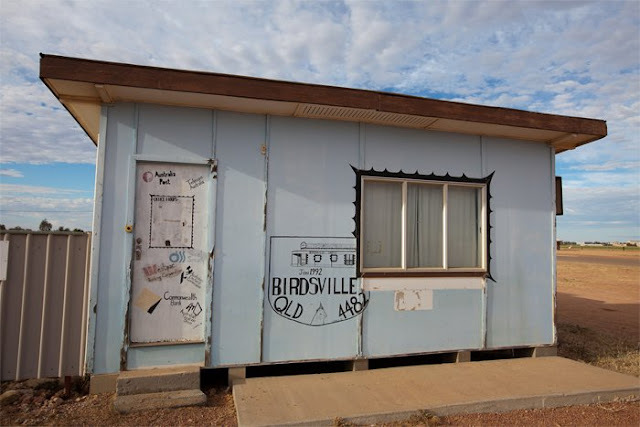 We made the call and decided the 217km to Boulia was achievable in daylight hours. It was 2pm, so we went for it!! The road was actually really good, nice scenery and a few POÍ. The first being a memorial for "Eddie Jolly Miller", the last Outback Mailman. His story was amazing! 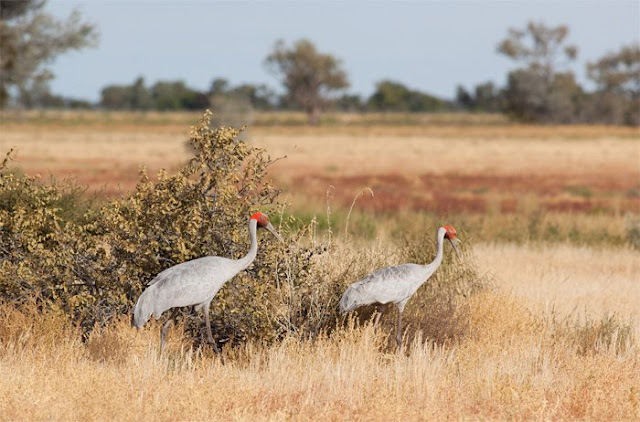 We passed some wetland areas and saw our first Brolgas of the trip! We also passed the other patch of Waddi Trees. The last 2km into town was rough, the road still washed out with ruts 2 or 3 feet deep we had to navigate around. These were somewhat tricky as they were also full of water so there was no real way to tell how deep they were. We had made a great run, it was only just after 4pm. 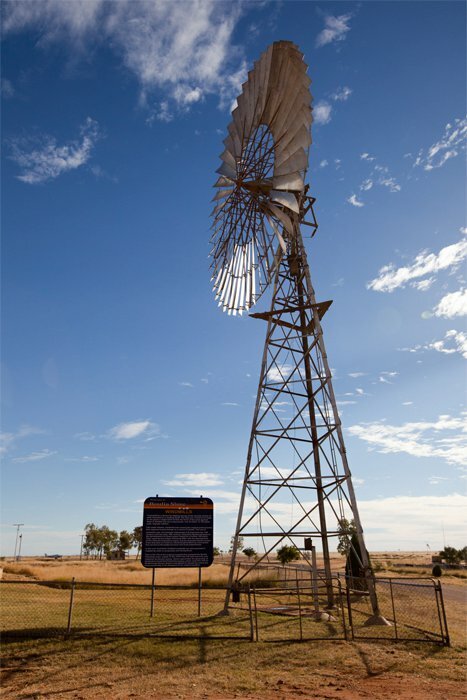 We had time to call into the Visitor Centre and also see the big windmill and tank at the Airport. We also took the chance to stock up on some more food from the 5star Supermarket, before doing a drive around town. We visited the Corroboree Tree (Waddi Tree) and also walked around the cemetery. There was a lot of history to be seen here. Someone had also left a hose running here and we had to find the wettest spot sinking into the sticky red mud. I was finally happy about not wearing shoes :) It was a good afternoon to set up camp early. We had directions to get to the free campsite for the town so off we went to the outskirts of town. Now all we had to do was head towards the racecourse, turn right on the track and head towards the river.... How hard could it be?? Turns out after about 20 side tracks, mostly only suitable for a 4wd later we found the right one... We had spent the best part of half an hour trying to find it! It was worth it though. We were camped under the Ghost Gums of the dry, sandy banks of the Burke River. It was awesome!! Very quiet and serene. I think there was one other lot of campers further along but we didn't hear or see anything from them.. Just how we like it! As the sun set and the camp fire started to roar to life I wandered around a bit and took a few shots of the campsite. As it slowly grew darker the thin layer of cloud from the day started to disperse, the sky looked amazing but as I was Head Chef again tonight, I couldn't wander far for any camera work until later in the night. This was one of my favourites anyway. I really enjoyed this campsite. One of my all time favourites I have been to. Very self sufficent, no loos or showers or anything man made. Just trees, wildlife and the river (dry). We would definately stop here again one day! After toasting a few marshmallows, enjoying a hot milo and again enjoying each others company, we devised a master plan for Day 8 and then we called it quits. It was a pretty big day, 570kms, lots of POI and a lot of photo stops. We both slept well again. We had now passed the 3000km mark so it was starting to really turn into an epic trip!! We both had no idea what the dawn would bring!! Keep your eyes peeled!